Because a child’s foot bones are still growing, they’re softer and more vulnerable than an adult’s. They won’t be fully developed until the child reaches his or her late teens. That’s why focusing on foot health and obtaining expert foot care from a chiropodist is never more important than during the early years of your son or daughter’s life. 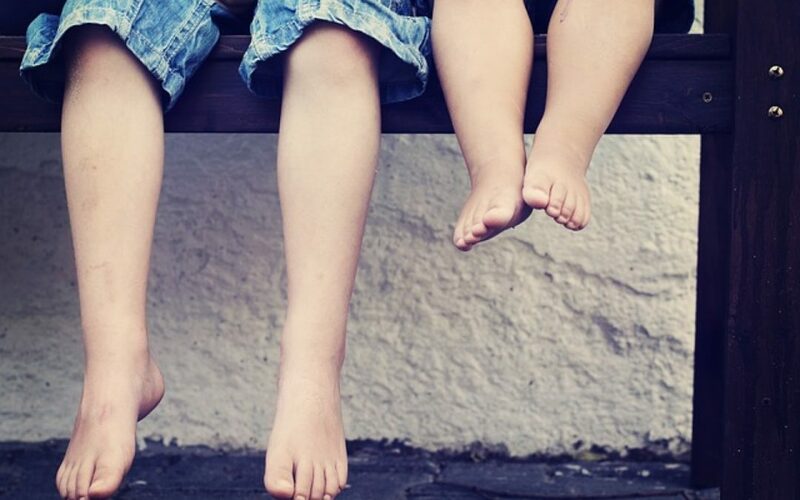 Feet that are well looked after throughout childhood are less likely to cause problems later on. Autumn can be challenging for children’s feet, with the new school term beginning and new shoes being worn. Little toes that have enjoyed the freedom of sandals for weeks are now being forced into tough, unforgiving footwear. In addition, some kids will inevitably bring home more than just homework – verruca infections, for example, can spread easily in PE changing rooms. It’s worth paying particularly close attention to your child’s feet – and shoes – over the coming weeks to spot any issues as soon as possible. Some kids can’t articulate what’s wrong with their feet; some feel too embarrassed or worried to try. The best approach is therefore to check your child’s feet regularly, perhaps at bath time. If parents make foot health a priority, children will learn habits that’ll be extremely useful to them when they’re old enough to examine their own feet. By helping your child to wash his or her feet several times each week, you’ll considerably reduce the chances of fungal infections, such as athlete’s foot, developing. Drying feet thoroughly is important – moisture trapped between toes can cause problems. Children’s toenails should be cut straight across so that they have flat, rather than rounded, edges, as that’ll discourage them from becoming ingrown. Calcium (found in foods such as milk, broccoli and bread) and vitamin D (from sunlight, egg yolks, oily fish, etc.) will help your child’s foot bones to grow strong. An active lifestyle is essential too, as regular exercise is beneficial to muscles and tendons. When buying any kind of shoes for your child, ensure they’re properly fitted at a shoe shop, so that you’re confident they’re the right length and width. The Children’s Foot Health Register can tell you which local retailers offer that level of service. We suggest parents check whether their children’s shoes still fit every few weeks. When shoes are only about 5mm longer than your child’s longest toe, it’s time for a larger pair. Another tip is to help your child practise walking with their feet nice and straight. What should you do if there’s a problem with your child’s feet? Perhaps his or her toenails are discoloured or causing pain, you suspect a skin infection has taken hold, new shoes have led to sores and blisters, or calluses are making walking uncomfortable. If you have any concerns, consulting our team of London chiropodists is a sensible course of action. Our four London chiropody clinics are hygienic, well equipped and convenient. What’s more, we take pride in our friendly, patient-focused approach. In addition to general foot care for children, we provide specialised care to resolve problems caused by foot abnormalities. For example, if you’ve noticed that the soles of your son or daughter’s feet are flat instead of arched, our foot specialists can help. Kids typically have flat feet until just over the age of five; arches should then appear. However, some children’s feet remain flat or develop arches only to lose them later. If your child still has flat feet and experiences foot pain, discomfort or stiffness, it’s important to seek professional advice. The same is true if he or she has knock knees, toes pointing inwards or outwards, shoes with very uneven wear or an unusual gait (i.e. manner of walking). We recommend you book a gait analysis session if your child has any of the above issues. We’ll examine the distribution of pressure across the soles of the feet with the innovative GaitScan™ system, diagnose any problems and provide effective treatment. Treatment usually includes custom-made orthotics that support the feet and relieve pain. Taking good care of your son or daughter’s feet can have lifelong benefits. For expert foot care for your child from a London chiropodist, please call Feet By Pody today on 0207 099 6657 or book an appointment online.